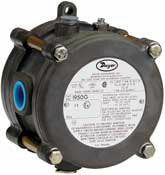 The Model 1950G Explosion-Proof Switch combines the best features of the popular DwyerÂ® Series 1950 Pressure Switch with the benefit of natural gas compatibility. Units are rain-tight for outdoor installations, and are UL listed for use in Class I, Groups A, B, C, & D; Class II, Groups E, F, & G and Class III atmospheres, Directive 94/9/EC (ATEX) Compliant for 11 2 G EExd IIB & Hydrogen T6 and CSA & FM approved for Class I, Div 1, Groups B, C, D; Class II, Div 1, Groups E, F, G and Class III atmospheres. The 1950G is very compact, about half the weight and bulk of equivalent conventional explosion-proof switches. Easy access to the SPDT relay and power supply terminals is provided by removing the top plate of the aluminum housing. A supply voltage of 24 VDC, 120 or 240 VAC is required. A captive screw allows the cover to swing aside while remaining attached to the unit. Adjustment to the set point of the switch can be made without disassembly of the housing. Process Connection: 1/8" female NPT. NOTE: The table at the left is for 24 VDC models. YOU can order the Voltage you want by selecting from the MODEL selection Boxes below. The proper model number will be selected. The Only change to the model number is the voltage.